I know its October, but I wanted to show you the April Scarf. I wrote this up a couple of years ago, but recently it got a little makeover and I reformatted the pattern and made it a little more concise and easier to read. 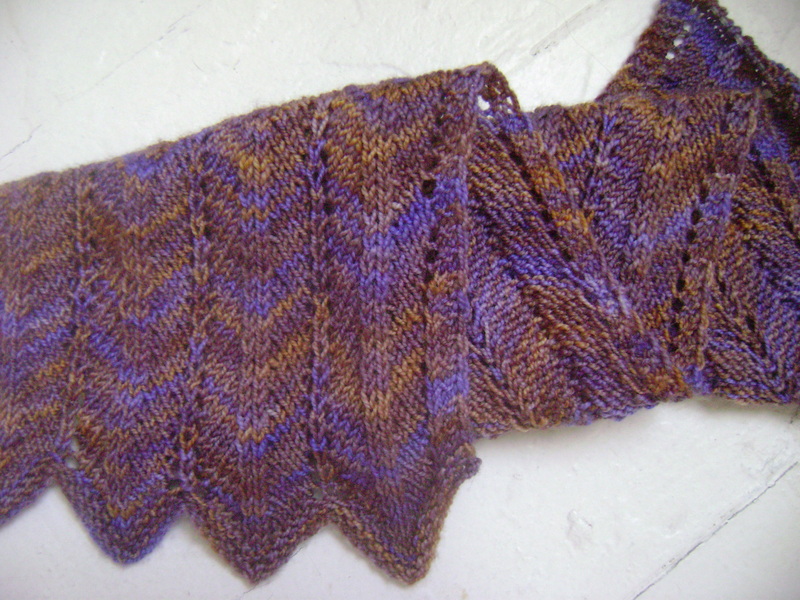 By no means did I invent the chevron stitch, its got many, many, many incarnations in the knitting-verse. But this is my little version of a classic. 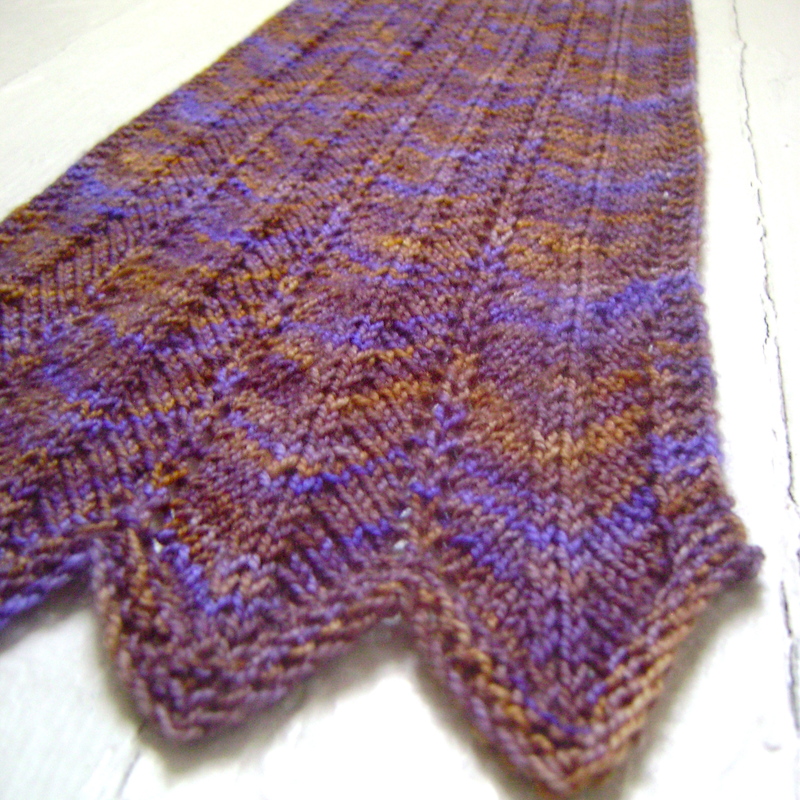 I really enjoy how the zig zagginess lets a delicious ombre or variegated yarn really shine. The colors get to play along the hills and valleys and the very simple stitch looks great but it doesn’t require strict attention. Its great for hanging out with friends and chatting or watching your favorite season premiere while your fingers stay busy. If you have already downloaded this pattern I hope you find the few changes helpful. If its a new pattern I hope you’ll enjoy knitting this slinky beauty up! Download the FREE pattern here. What are the multiples of stitches for pattern, i.e., 6 lots of 8 stitches plus side stitches. I would like to do a wider scarf, but need the multiples. Hi! The pattern is a repeat is 13 stitches. I would love to see a bigger repeat scarf! There are three stitches on either side as a selvedge edge. I can’t seem to download it on Ravelry. This happens quite often with Ravelry for some reason. Is there another way please? Oh I like this design. Thank you for sharing. 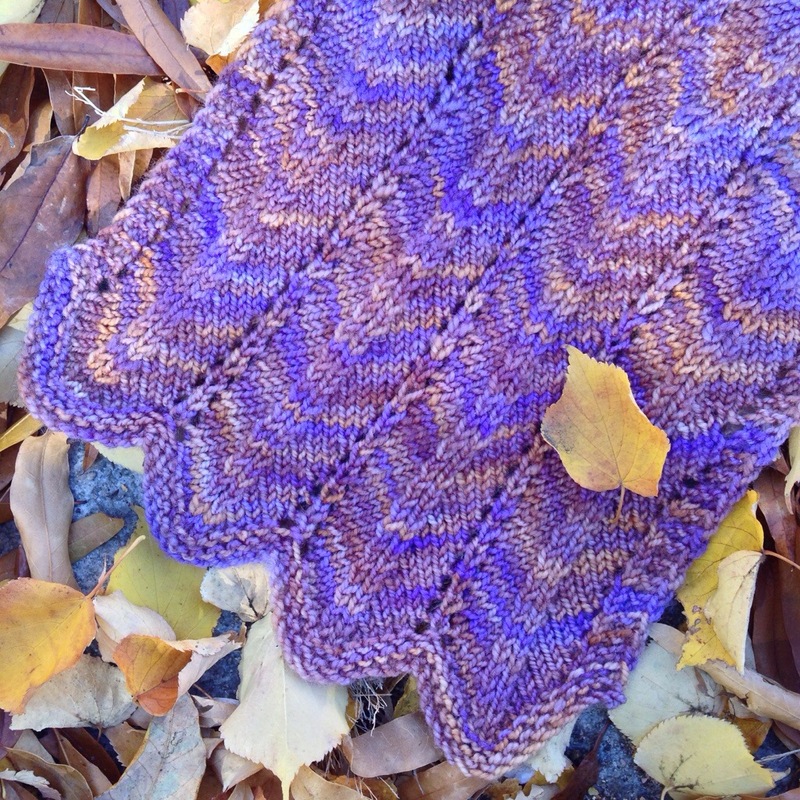 The pattern says 114 yards of yarn required, but the Ravelry page says 350 yards. Is the Ravelry page for a wider scarf than the actual pattern? HI, The original scarf used just one skein of Koigu KPPPM, it was a short scarf, about 40″ long. When I listed it on Ravelry I changed the yardage so that people would know that they needed two skeins if they wanted a more standard length scarf. But thanks for pointing that out, maybe I need to change the yardage on the pattern. Thanks! Tried twice to download pattern, but could not get it. Is there another way to get it? It is beautiful – I would love to knit it. I knit a scarf a week. I am going to a family reunion in South Africa at the end of this year and intend to give each women there a gift of a hand knitted scarf. The April Scarf looks amazing! I think I will knit it in several colors. Please would you be so kind as to email me the instructions as I don’t seem able to download it. Hi! That is so cool! What a special gift. I’ll email it right away. Of course! When you begin the new row you hold the yarn to the front of the work, like you would when making purl stitches. You would insert your right needle into the first loop from back to front like you are going to purl, but instead of making a purl stitch, you slide the loop over onto the right needle. Then you bring the yarn to the back between the slipped stitch and the remaining stitches on the left needle. This will make all of your stitches along the edge lay nice and flat and you won’t have any of those pesky bumps along the edge. While it isn’t necessary for the piece to be functional, it does make it much prettier and neater looking. I hope that answers your question! I am unable to download this pattern also. My E-mail address is as follows. I am unable to download this pattern, and I would dearly love to knit it. would it be possible for you to email me the pattern, please and thank you…. This is a very simple pattern to knit and, as you say, looks best with a slight ombred yarn which will show off the hills and valleys of the chevron pattern. But can you show the other end? What I don’t like is that one end has those great points, but the other end is the reverse! Is there a way to start in the middle, for example, and knit outwards so the ends would be the same? It’s a great design, but I don’t like one end of it!! Love the pattern! One question: Are all the LS1s purlwise? Even in the body of the pattern? If you’ve already answered this question, or it is explained somewhere in the pattern, sorry if I missed it! Thanks. This pattern will not fully download it just gives the requirements. Just an idea for others…. I made the scarf but I made 2 scarfs half my desired length (30 inches) and then joined them using Kitchener stitch (60 inch total length). Both ends have the same peaks and valleys and the join is not noticeable at all. I love it.